Submitted to Enough 14. Edited machine translation by Enough 14. Keyenberg, German territory, February 9, 2019: A group of 7 people has been blocking an excavator from the Garzweiler II open-cast mine in the Rhineland brown coal mining area since 6:30am. The excavator moving towards Keyenberg had to be stopped. At the same time, about a dozen residents from villages threatened by dredging demonstrated with a vigil. They draw a red line at the edge of the mine against the destruction of their villages and the climate. The climate activists and residents from villages such as Keyenberg and Berverath protest with their actions against the results of the coal commission. “This coal excavator is eating its way through the countryside straight to my home. Every hour it stands still is a good hour,” says Andre Brosch from Berverath. In its final report, the Coal Commission promises the energy suppliers billions in compensation, while formulations to protect the threatened villages and the Hambach forest remain spongy or missing altogether. “A coal exit date of 2038 is not a consensus, but the funeral march for the Paris climate targets. It is a crime that the federal government wants to abandon the 1.5 degree climate target. The movement for climate justice will not allow that! The people who block the excavator are effectively protecting the climate,” says Daniel Hofinger of the group, commenting on the actions. “Whether Keyenberg or villages in Colombia and Russia – as long as Germany burns lignite and hard coal, people’s livelihoods will be destroyed worldwide. RWE has turned the pseudo-coal exit into gold for itself, while those affected are to lose their villages. This is a scandal,” said Hofinger. According to the plans of the Coal Commission, Germany would continue to generate electricity from hard coal for another 20 years, one hundred percent of which would be imported by the energy companies. Human rights violations and environmental destruction are taking place in the mining areas. The actions at the Garzweiler II opencast mine are part of a nationwide week of action to protest against the final report of the coal commission. 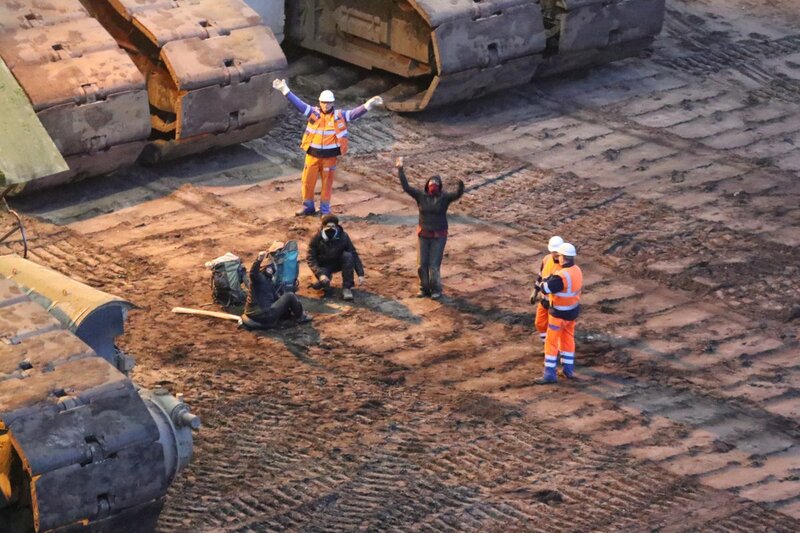 After the excavator occupations of the Ende Gelaende coalition on February 4, 2019 in Lusatia, 18 of the activists were arrested and are in pre-trial detention (At the moment three are stil imprisoned, the others were released in the past days, Enough 14) . They are accused of trespassing. “Today’s protest shows that people who fight for climate justice are not intimidated by absurd criminalisation,” Hofinger says. Cops cleared the blockade and detained seven activists later today. All seven are accused of trespassing. This evening two people were released and the legal team excpect that a third person will also be released tonight. A judge decided that four others will be imprisoned because they refused to give their identity to the cops. They will be kept in police headquarters of Mönchengladbach in the Krefelder Straße 555 until Thursday 12:00. Follow Twitter account @anti_rrr for updates. Previous post: The Invisible Committee: Power is Logistic. Block Everything!